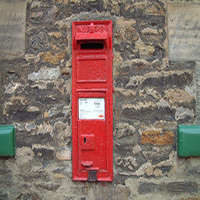 Over the last few months thieves have been targeting the red traditional post boxes across the country. These traditional post boxes have been a feature on our streets since the 19th century and a essential part of our postal system. The large majority of the thefts have been taking part in rural locations where there is less chance of interruption. Police are not sure if the metal post boxes are being stolen for the scrap value, contents or heritage. The Letter Box Study Group which is a group of enthusiasts specialising in the British letter boxes has become the authority in the history of the traditional post boxes, they estimate up to 200 boxes are stolen every year. The Royal Mail aim to protect our big red metal post boxes by attaching electronic tracking equipment, this will allow our police force to locate any would be thieves after they moved the post box. Searches on popular online auction sites relieved people were willing to offer £5,200 to £5,775 for the more unusual post boxes. If you are interested in keeping your own post secure check our high security post box range! These metal post boxes have been manufactured to protect your mail from theft and vandalism.